Details at the end of this post on how to enter to win a copy of Water Witch either on Kindle or Nook, along with a link to purchase it. The story introduces us to a young witch named Hannah Everhart, who is an ancestor of a friend of Jane Yellowrock’s. She has stolen something and DB Jackson’s thieftaker is on her trail. They end up working together to stop something terrible from happening in Boston that could change the future. This is a very fun short story which throws in a nice bit of real history just before the Revolution. The two work together wonderfully (the characters and the writers) and I really hope to see these characters come together in a book as well. I had never read anything of DB Jackson’s before, but now I will, and Faith Hunter’s books are already on the top of my tbr pile. 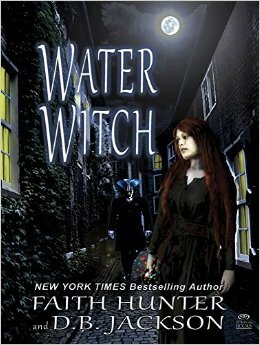 If you are looking for a fun, quick, historical fantasy short story don’t miss Water Witch. It is only available as an e-story. To enter to win a Kindle or Nook copy of Water Witch, simply email KRL at krlcontests@gmail[dot]com by replacing the [dot] with a period, and with the subject line “Water,” or comment on this article. A winner will be chosen July 11, 2015. U.S. residents only. If entering via email please include your mailing address. Great review and sounds like an good read! Will definitely have to check this one out. I would love to win! The Everheart history is something I’ve been wondering over 😀 Thanks for the chance! I’d certainly enjoy a free copy from you! You know how much I love your writing 😀 Thank you!! I would love to win this book! Have read all of the Jane Yellowrock series and this would be a good way to get into the thieftaker series.